We wish everyone an enjoyable and successful season. The Leinster Region Annual Conference will take place on Tuesday 12th February at 7.30 p.m. in Irish Sport HQ, National Sports Campus, Dublin 15. Please read the attached notice for further details. Please contact the Leinster Secretary if you have any queries. The Leinster Swimming Gala Schedule for the 2018-19 has been published. For simplicity, the Schedule is again being published as a PDF document this year. Please click here for the latest copy of the Schedule (Ver 5 - 20 Aug 18). Leinster Swimming are delighted to announce a pilot program aimed at 16-19-year olds in the regional swimming clubs. We recognise that the dropout rate from competitive swimming increases significantly from the age of 16 years upwards. This program is designed to retain athletes within aquatics sports. Leinster Schools Swimming Championships 2018/2019 will take place in the NAC on Sunday October 21st 2018. Details on the Schools Page. Leinster Schools Swimming is pleased to announce the Leinster team for the Irish Interprovincial Schools championships 2019. Click here for the full list. The Schools Interpro will be taking place on Sunday 14th April in the NAC. We would like to take this opportunity to wish all the swimmers the very best of luck. Peter O'Brien, Portmarnock SC, was appointed as Chair of Leinster Swimming at the recent management committee meeting. We wish Peter the very best of luck on this new journey and look forward to working with him. We would also like to thank our outgoing chairman, Phillip Fitzpatrick, for his 4 years of dedicated work with Leinster Swimming. Phillip has encouraged and mentored the committees in Leinster during his time as Chair and has been a great team leader. We wish him well on his next endeavours! The Leinster Trainability Squad will commence in the NAC in on September 29th, 2018 at 16:00. Information regarding the squad is outlined on the Clubs Page. Could we please have all applications in by next Sunday - September 24th. There will be 50m lanes available on Sunday evenings in the NAC from 4.00 - 6.00pm for clubs to train squads of their age group swimmers. Clubs can hire either one or two lanes per session. There should be a maximum of 10 swimmers per lane and 20 swimmers per club. The cost is €50 per lane for a 2-hour session. Applications for lanes should be sent to leinstersecretary@swimireland.ie and a rota will be drawn up in two stages over the year – from now until December and January until June. Once the lanes have been allocated and confirmed by the club, payment will be required in advance. Clubs will be invoiced by the Leinster Treasurer for the bookings in each session. The latest 2018 Meet Licence Guidelines have been published with some additional notes on the Clubs page. The first draft Swim Ireland Season Plan for the 2017-18 has been published with some additional notes on both the Clubs and Technical pages. National and Regional Squad Programmes have been published with some additional notes on the Technical page. The News link will provide the most up to date information on galas. As soon as information is distributed by the gala secretary, it will be uploaded on the website. Draft programmes will be published for all regional galas at least 2 days prior to event and the club roster will also be published on the site as soon at it is issued. We would urge all clubs to send in news items/photographs for inclusion. Please forward items to the Secretary or info@swimleinster.com. Payments to Leinster swimming can be made by cheque or by bank transfer. Please reference the club and gala .on the transfer narrative. Please email the treasurer on : leinstertreasurer@swimireland.ie to confirm transfer. Please understand that it is very important to identify the sender, the reason for payment and to be able to make contact if necessary. To enable Leinster to run these events we require the co-operation of all Clubs and the support of many individuals. There must be a Team Manager in attendance with every team. The Team Manager’s name, along with gala officials must be submitted with gala entries. Failure to do so will result in entries being returned. Swimmers may not compete if there is no Team Manager available. The Quota System regarding gala officials will continue to operate. Each club must provide a quota of officials per swims for each gala. This quota will be set once the entries have been received, and clubs will be notified. Failure to provide officials will mean swimmers being excluded from that session. In keeping with our aim to provide the best facilities for our swimmers, we would ask designated timekeepers to wear a white polo top, navy bottoms and suitable poolside footwear. If a Club has HyTek Team Manager Programme, please submit entries by e-mail. We would encourage all Clubs to invest in this programme for ease of organization. Best of luck for the season ahead from the Swimming Committee. This site will depend on your contributions to keep it alive and active. We will try to keep it current and to accommodate your contributions. If you would like to contribute to the Leinster web page or if you see anything not working or needing correction/updating please email your text or photos (not too big!) or comments to (Tom Roche) info@swimleinster.com. Click here for Issue 4 of the Leinster Newsletter. The 2017-18 version of the Leinster Region Operating Procedure is available. Click here to view it. Click here to download the latest version of the Swim Ireland Complaints and Disciplinary Rules and Procedures. This is an important document that should be studied by all Club Committees and made available to Members. Master's News, Records and Claim Forms are available here on the Irish Masters website. 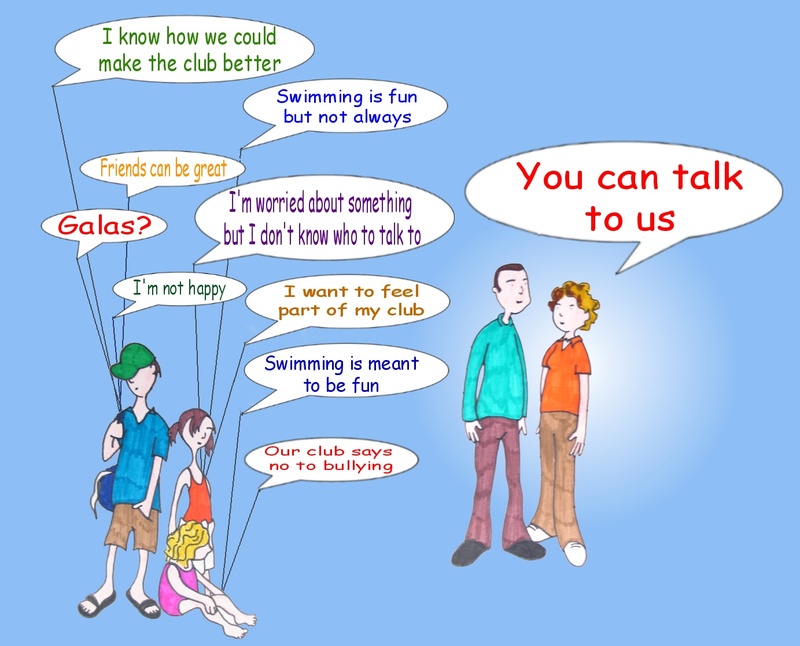 Swim Ireland have updated Child Welfare guidlines and have issued a Poster.